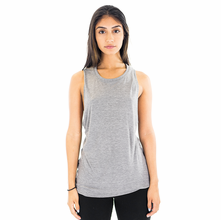 Head to the gym or the local park in this muscle-inspired women’s tank made from an eco blend of bamboo and certified Organic cotton. With a comfy, form-fitting design, this sleeveless shirt keeps you cool and comfortable while working up a sweat. Bamboo is the perfect workout fabric since it’s naturally moisture-wicking and antimicrobial. We recently added this Review capability. Please help others by leaving your feedback when you receive a review request after purchasing this Women's Bamboo Organic Cotton Muscle Tank Top from Yes It's Organic.